The AAFFM opened it’s doors as a Museum on December 13, 1997. The dedication of the Museum also served as the acknowledgement of what was believed to be the city’s first 100 years of service by African American Firefighters (1897-1997). In 2002, the Los Angeles Times contacted the AAFFM and stated they had discovered factual information to indicate the history started before 1897 with a man named Sam Haskins, who was listed as the first Los Angeles Fireman of African decent when he was hired in 1892 and killed while responding to a fire in 1895. Today the AAFFM stands as the first and so far the only free standing African American Firefighter Museum in the United States. The first floor contains vintage fire apparatus, stories and pictures of pioneering African American Los Angeles Firefighters. The Museum gallery is located on the second floor with pictures, artifacts and other memorabilia of African American Firefighters from around the country. There is a memorial moving tribute to the firefighters that perished during the 9/11 attack on the World Trade Center in New York City. Today the Museum is open to the public and is strictly volunteer and donation driven. It is a 501 c(3) non-profit organization and it is available for use by organizations and individuals that desire to host events such as; meetings, luncheons, dinners, banquets, book signings, film viewings, jazz festivals, social dances, receptions and retreats. Our beloved historian, 96 year old retired Firefighter Arnett Hartsfield, who passed away in 2014 was our most cherished volunteer. As a Los Angeles Firefighter during the 1940s and 50’s he lead the integration of the Los Angeles Fire Department. As a graduate of USC law school, he and his fellow firemen known as the Stentorians, the NAACP and the local community were instrumental in successfully integrating the LAFD. The stories of the men that endured that horrific fight are told by the museum’s photographs, paintings, and artifacts. Entering the African American Firefighter Museum, located across the street from the historic Coca Cola Building on South Central Avenue in Los Angeles, California, is like taking a step back in time. 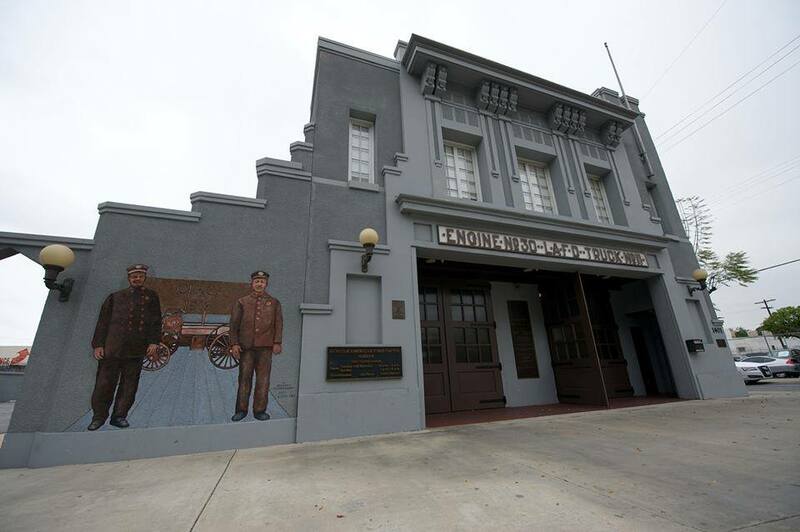 The museum is located at the historic Fire Station #30, which was one of two segregated firehouses in Los Angeles between 1924 and 1955. Former Museum President and Fire Captain, Brent Burton, shared numerous stories of African American firefighters while taking FDNNTV on a tour of the museum’s displays. “When the fire department integrated, blacks were forced to sleep in the same bed, in the same location, and the other black firefighter on the other shift, slept in the same bed. White firefighters refused to sleep in the same beds that black firefighters had slept in,” Burton explained. According to Brent Burton, prior to building Belmont High School in Belmont, California in 1924, the city was a very deserted place. However, when the school was built, the department, community and school district became concerned about school children looking at African American firefighters in positions of authority; therefore, they relocated the African American firefighters to Station #30. The particular area where the station is located happened to be where many blacks were beginning to segregate towards when they migrated to Los Angeles. 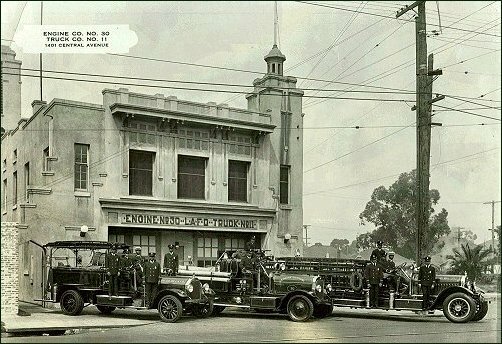 In 1936, the LAFD opened Station #14 at 34th street and Central to blacks. Making it the second station that blacks could be assigned to. When the stations became integrated in 1955, firefighters from Station #30 and #14 were transferred to other stations and were met with extreme hostility. In June of 1955, Firefighter Rey Lopez took a photo of a sign reading, “White Adults”, Arnett Hartsfield submitted it to the media. This photo exposed the racism within the fire department and lead to more equal rights in the fire service. Unfortunately, change did not come quickly. Captain Burton told a particular story of an African American Firefighter named Ernie Roberts, who entered the service around 1947. When Roberts was integrated in 1955, he was amongst the first group of black firefighters to be sent from Station #30 to another location. When Firefighter Roberts was attempting to settle into his new station, a group of white firefighters took Ernie’s pillowcase while he was out, used it as toilet paper in the restroom, replaced it on his bed, and turned the lights out. “The whole practical joke and prank was for Ernie to come back, get in bed and lay his head in it,” added Burton. The museum’s purpose is to promote diversity and to stand up for inequality against all races and genders. Burton said that while great strides have been made, inequality is still present. He claims that in present-day there is a decrease in the hiring of African Americans in the fire service. Burton continues his recruiting efforts and visits South Los Angeles schools to speak about firefighting to students. The African American Firefighter Museum is open to the public, with free admission, Tuesdays and Thursdays from 10:00 a.m. to 2:00 p.m., and Sundays from 1:00 p.m. to 4:00 p.m.” The museum is completely run by volunteers and also completely driven by donations.